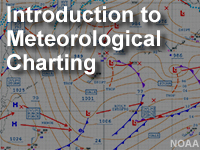 This lesson provides a brief overview of surface and upper-air data and how these data are plotted on meteorological charts. The content introduces various charting and reporting techniques, including station models, contour analyses, streamlines, and upper air maps. Examples cover both the Northern Hemisphere and Southern Hemisphere and provide learners with opportunities to practice recognizing frequently used weather symbols. Supplemental materials include three Weather Symbol Identification drills. Completing these drills may require approximately 1-1.5 hours above the length of time estimated for the lesson. Can be a little hard to remember all of the information that is given at once. Especially later on during the quiz. I love this! I learned alot! This course is fairly specific to reading charts, and many people will not need this skill. However, if you have any interest in the subject matter, it's a well-done course. It also gives useful background to general weather patterns and behavior. I liked this course, everything's presented in easy for understanding way with useful exercises. very interesting. Need to concentrate more. Thank you indeed for recapping. Great Refresher and good initial interdiction course. I like the design, it is almost perfect and user-friendly. Once again, unable to determine why I got questions on quiz wrong. It i fun to deal with a surface weather map and upper air analysis. Need more practical exercises to familiarize more with ridges and troughs differences. Could use a bit more complexity. Maybe more in depth discussion about other charts. For me it was a great review, I am a CDN Military Mettech and have not studied southern elements that much so some points helped refresh my mind and thinking process for my upcoming Forecast Course. It was very understandable with contents simplified. Overall, this lesson took me ~2 hours to get through. I don't know if it was because there was a lot of information involved or if it wasn't appealing to my learning type, but it wasn't difficult to get through either. It definitely helped my understanding of weather charting and that was the goal! I think you can improve this by adding more visualization. The content is understandable, but for international students it could be a bit challenging. This lesson is somewhat like an online textbook with automatic quizzes. They test you as you learn, so you'll automatically remember what you have learned. I have found this lesson to be very interesting and informative. It has helped me in the preparation of lessons for my students and I am better prepared to deliver explanation and respond to questions posed by students. An amazing course! As a weather enthusiast, I enjoyed learning about weather charts and maps and how to interpret them. However, my favorite part was the drills over the 100 present weather symbols. Although it is not a mandatory part of the course, I highly recommend checking it out at the end! Good lesson. Struggled with a few concepts. Will revisit the quiz after some review. Lessons learned increased my knowledge on what actually happens in the atmosphere and really what explains what I did every day reporting the weather. Been taught in doing meteorology training but this course widens my knowledge. Very interesting. Being an observer what I had learned here are very relevant to my job and although I am not a forecaster it has broaden my knowledge as I go through this quiz.Thank you very much for such informations which are made available to the public. Very interesting in identifying areas of improvement and the ability to compare both test score to see how well you have improved. As someone in the Northern Hemisphere, I personally would have liked the option of focusing the learning on Northern or Southern Hemisphere depending on your interest. there was way too much info to go over in just one lesson. Well broken down and well explained material. Very clear and dynamic. You don't need previous knowledge, or minimal. I only took the beta quiz and had a short look through the lesson (mainly to compare it with my way of doing it) - it appears well done. I didn't know anything about weather maps and this module helped me understand them very quickly and easily! Simple language, with a lot of examples and exercises that helped my learning experience. It took me way longer than .75h to complete the lesson. I think the completion time should be changed. The overall experience is a well paced presentation of useful, basic weather concepts. I would rate the skill level a bit higher. I have some weather training and familiarity as a sailor. That background helped me understand some of the content. The completion time for me was closer to 3 hr. plus the test. The supplemental questions were difficult because the symbols used were not provided. The questions would be good practice if a complete list of the weather symbols was included. I found this module very helpful for me at my level of meteorological knowledge. I have always had an above average interest in the weather. Basic weather geek with a strong background in science. Now at 68 in retirement I have the time and passion to really try to understand the physics and develops a deeper understanding of the overall interaction of the air masses and their movement within the atmosphere. I'm finding that there is so much out there that it's hard to know where to start and after getting stuck in some of the advanced good stuff I want to learn I'm seeing the importance of getting a very solid base in the fundamentals first. I found this course very helpful in allowing me to see that I have made a good start and now see what to work on next. Great internet sources are sprinkled throughout the course. Thanks for producing this module. This is a clear and well guided important course that can be done on your own time - good reinforcement of learning, good references for further study and clear goals and objectives. I am still having trouble reading 500mb charts and correlating with surface - even more with satellite images - these could be strengthened with more exercises. The interactive images such as the scrolling to see surface and 500mb on the same screen is VERY useful. Quizzes are good checks. Thanks - a useful exercise - I need to take it the next step to predict weather using all this information. Very interesting and well laid out. Also very educational for those of any level of training.